Forum Index > Off-topic Talk > What is a CNC Machine? Posted: Fri 09 Apr, 2004 10:03 pm Post subject: What is a CNC Machine? the subjectline is my question. i have seen it mentioned, but dont know what it is. is ist a cold cutting machine like a hydro cutter, a miilling machine or what? CNC isn't a specific type of machine, but rather a specific way of controlling a machine. It's computer controlled. Some of the more fancy ones you can lock a block into the mill (or lathe, or whatever), index a point on the block, and use a file, like a cad drawing, uploaded to the computer controller. The machine pretty much takes it from there and cranks out your part. Really good for high output production lines (router bits, factory knives, etc.). For the time it takes to program it, it's not worth it for just a single object. I'm a CNC/Fitter and Turner apprentice and you can get CNC for just about anything that can do any job you need it to...Alot of the time with the older FANUC controllers using CAD as an imput for the program doesnt work well and you can crash it (just the experience from within our shop, we no longer use CAD programs that can be imported as a program). our major machines are either FANUC, MAZATROL (MAZAC) and OKUMA...basically I get to run the best machines out of Japan and the US. 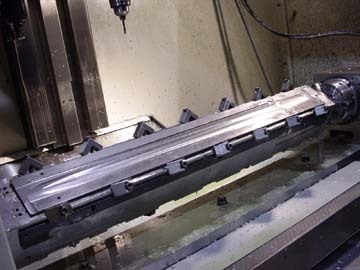 I run ATM the biggest CNC machine in the southern hemisphere, 10 pallet OKUMA machining center and we do things like anchor ends for hydraulics, clevis etc etc. It needs the use of coolant for all jobs running at high speeds, other wise swarf build up becomes a problem...you have your CNC milling machines which can drill and mill basically then you have CNC lathes. All quite easy to learn if you have the apptitude, but its easy as hell to crash one when running at the speeds these things do...and ALOT can go wrong with them from just regular use. www.ptehydraulics.com.au is where i work and if you look on there you can see some of the M/C's i run...it hasnt got our new machines on there but some of the more impressive stuff is on there. Posted: Sat 10 Apr, 2004 10:46 am Post subject: Re: ?What is a CNC Machine? The others have pretty much told you what a CNC machine is. For sword blade manufacture, you need a CNC mill with enough travel to machine the blade blank. I'm glad someone asked this Ever since I saw mention of "CNC" on Albion's site, I have been wondering exactly what one of these machines does and how it plays into swordmaking. In specific relation to sword milling, here are a couple of pics of Albion's set-up. Jason very nice machine, the setup looks great...most of our machines are designed for milling only the verticals of a job and small to medium sized pieces at that. Its nice to see a machine like this, I myself want to use my apprenticeship as a footstep into producing swords and its even nicer to know i could use my CNC skills for that. I knew about those machines and the CAD ability. I just did not know they were called CNC. i understand that you can use those to quickly mill prototypes out of UHMW for quick and cheap mechanical working models. do you do the heat treating with a computer controlled machine as well, mr trim? if you do it by hand, i would appreciate any tips. Woah, half dozen responses & nobody mentioned it's an acronym for "Computerized Numerical Control ". To oversimplify, and restate what others have said, you program whatever machine you are using, feed it stock & let it go to work. Some even have automated tool-changers or mutiple working heads. (sweet- robotics). CNC works great for turning out lots of precision items. It's an expensive set-up though and Howard & Amy's guys probably have to turn out a lot of blades to recoup their investment. I'm perfectly willing to help with that! lol you guys get CNC machines a fraction of the cost they are here in australia...Importing from Japan works out to be the cheapest method of aquiring CNC. I just found out our shop just got another MAZAC multiplex, here they sell for about $550,000 used, this one they got for a fraction of the price. 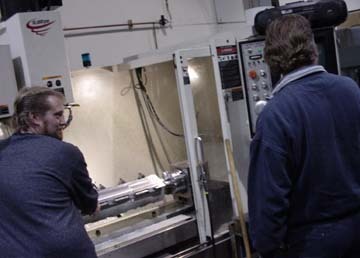 All of ours have auto tool change, and the CNC lathes have auto rotating turrets of up to 16 tools. IMO its great to see them utilised for sword making, I mean you save so much time shaping etc then forging for semi-production pieces. Forging will always have its place, and I prefer a forged tang but for blade shaping cant go wrong with CNC. Another thing about CNC not mentioned yet is the programming...no two machines (unless the same model or same controller unit) will be exactly the same, you have so many different styles of programming. ISO is a older manuel programming style used with FANUC contollers alot, and then newer automated ones which work out automatically the feeds and speeds just by imputting the material being used, the tool, length of tool (auto set with a tool measurer). I'm a few months away from completing my first year as a CNC/fitter and turner apprentice...at first it was sooooo confronting seeing all the buttons and code on the controller, but every week it seems to be falling into place. thanx to all of you . especially jeff johnson for pointing out the obvious oversight. saved me from having to ask and sound even less knowledgeable. most of those features you guys described, i knew about. just not by name.The names of the programing languages and protocols are way over my head. but I love learning more from the experts.I may soon have the opportunity to use some simple mechanically controlled het heavy industrial milling machines to out in fullers. i might also lathe some pommels or something. I can't wait to actually own a good sword. when i actually make one i will me sure to show you guys pics and an impartial hands-on review. actually $550000 sounds cheaper than i would have thought. are your machines mostly used for smaller stock? max sized piece is 13 inches wide on the mills and 5 1/2 on the lathes...its only parts for hydraulic cylinders...the barrels though we do up to 8 meters long. Our machines are mostly bought second hand, if they get a good deal they get it, repair then use. ours new would well be into the millions of dollars, but our factory has like 9 tradesmen and a few laborers, then CNC operators who dont have trade papers...all up about 28 guys, and we max over 1 million a month. so our machines work pretty full on and nearly 24 hours a day 6 days a week. 2 of ours has robotic arm feed, so those two can be run by one person...nifty things to use once your competent on them. manuel lathe and mill work is easy if you know your speeds and feeds and right tool setup...for single one off pieces using a CNC is over kill and a waste of time. sounds like you are making money and have job security. plus you are producing something substantial not just trading in things that already exist. are you involved in the management? do you have input into the purchase of the machines? I do as I'm told, I just happen to be rather smart (picked up more in one week then others do in a few months)...smarter then most, got in trouble once when i was going through some problems at home (ya know, letting stresses get to ya) and the only reason they didnt fire me is cause they know i've got the skills to learn the job better than most tradesman. I have work today and apparently one of the new machines arrives so I think i'll be having fun tonight playing on that thing, my machine they recently put me on is like 20 years old and finally kicked the bucket (told them it would, all the servo's and limit switches were stuffed in it). but its got 10 pallets, a auto tool magazine of about 100 tools so its gonna either be a nightmare or fun...only thing i dont like is its ISO programming, the manuel cr@p.
I never knew that's what you did. When you end up stateside, you might check out the Houston area. There's lots of places that al;ways seem to be looking for a CNC operator. I worked down at a NASA contractor doing class II machinist work...but the closest I got to CNC was looking over the shoulder of a *real* machinist from a distance! That was a decade ago. I'm not sure I even remember which part of the lathe turns these days! Those are some neat pics of Albion. I didn't realize anyone was going this full-tilt on production swords. Thanks for the tips on where to look, I'd like to persue something sword related if possible but either way machinists make ALOT more money then here. I'm kinda old to be an apprentice but oh well, I needed a job bad and some focus in my life and boom boom boom here I am. aside from that though i'm gonna get some advanced metallurgy courses in, and practical engineering based heat treating...that way if no one needs a CNC machinist i can do my own thing.